Offering you a complete choice of products which include single head liquid filling machine, single head paste cream filling machine, bulk container filler system for packaging of dry bulk materials into drums and bulk bags, single head liquid filling machine without stand and pallet covers internal warehouse movement. With the aid of our technologically advanced manufacturing unit, we are able to provide our clients a wide array of Single Head Liquid Filling Machine with Stand. This filling machine is engineered by using finest quality stainless steel 304 as raw materials and latest technologies at our advanced infrastructure of production unit. Offered filling machine is checked on numerous parameters in order to dispatch a defect free range. 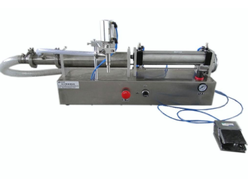 Additionally, we offer this filling machine in various specifications according to the demand of customers. We have marked a distinct position in the market by providing a precisely engineered range of Single Head Paste Cream Filling Machine. Offered filling machine is developed from the top quality material & latest technology in fulfillment with the standards of industry. 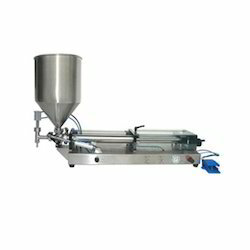 This filling machine is tested in terms of quality so as to dispatch a defect free range. 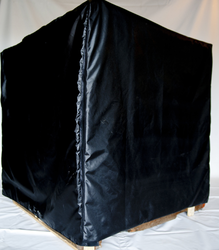 The offered filling machine is provided in various specifications as per the requirements of customers. 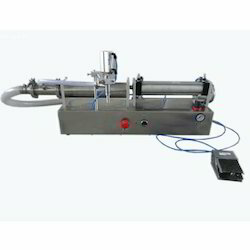 We are noted as the leading manufacturer and supplier of Single Head Liquid Filling Machine without Stand. The offered filling machine ensure faster and efficient filling of liquids and are extensively used across cosmetics, pharmaceuticals, food, chemical and agro industries. Offered filling machine is inspected by experts before dispatching at customer's end. 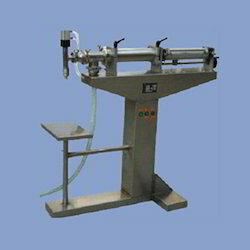 This filling machine is available in numerous specifications according to the needs of our clients.